Super Greens Southwest Kale Salad is the healthiest and tastiest salad on the block! Loaded with creamy, crispy, crunchy and cold health foods that will make your tastebuds sing. Preheat oven to 400 degrees. Lightly spray baking sheet with non stick cooking spray and set aside. Toss chicken pieces in oil and seasonings. Spread evenly onto baking sheet and bake 15 minutes, turning once. Cool slightly. While chicken is cooking, place all ingredients for dressing into high powdered blender. Blitz until garlic is fully incorporated. Pour into serving bowl. 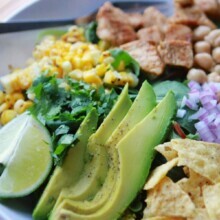 Arrange each bowl with kale and other greens, corn, garbanzo beans, avocado, cilantro, onion, tortilla strips, etc. Top with chicken pieces and drizzle with dressing.